A group of physicists recently built the smallest engine ever created from just a single atom. Like any other engine it converts heat energy into movement – but it does so on a smaller scale than ever seen before. The atom is trapped in a cone of electromagnetic energy and lasers are used to heat it up and cool it down, which causes the atom to move back and forth in the cone like an engine piston. The scientists from the University of Mainz in Germany who are behind the invention don’t have a particular use in mind for the engine. But it’s a good illustration of how we are increasingly able to replicate the everyday machines we rely on at a tiny scale. This is opening the way for some exciting possibilities in the future, particularly in the use of nanorobots in medicine, that could be sent into the body to release targeted drugs or even fight diseases such as cancer. Nanotechnology deals with ultra-small objects equivalent to one billionth of a metre in size, which sounds an impossibly tiny scale at which to build machines. But size is relative to how close you are to an object. We can’t see things at the nanoscale with the naked eye, just as we can’t see the outer planets of the solar system. Yet if we zoom in – with a telescope for the planets or a powerful electron microscope for nano-objects – then we change the frame of reference and things look very different. However, even after getting a closer look, we still can’t build machines at the nanoscale using conventional engineering tools. While regular machines, such as the internal combustion engines in most cars, operate according to the rules of physics laid out by Isaac Newton, things at the nanoscale follow the more complex laws of quantum mechanics. So we need different tools that take into account the quantum world in order to manipulate atoms and molecules in a way that uses them as building blocks for nanomachines. Here are four more tiny machines that could have a big impact. Researchers from Singapore have recently demonstrated a simple but nano-sized engine made from a highly elastic piece of graphene. Graphene is a two-dimensional sheet of carbon atoms that has exceptional mechanical strength. Inserting some chlorine and fluorine molecules into the graphene lattice and firing a laser at it causes the sheet to expand. Rapidly turning the laser on and off makes the graphene pump back and forth like the piston in an internal combustion engine. The researchers think the graphene nano-engine could be used to power tiny robots, for example to attack cancer cells in the body. Or it could be used in a so-called “lab-on-a-chip” – a device that shrinks the functions of a chemistry lab into tiny package that can be used for rapid blood tests, among other things. The rotors that produce movement in machines such as aircraft engines and fans all usually suffer from friction, which limits their performance. Nanotechnology can be used to create a motor from a single molecule, which can rotate without any friction. Normal rotors interact with the air according to Newton’s laws as they spin round and so experience friction. But, at the nanoscale, molecular rotors follow quantum law, meaning they don’t interact with the air in the same way and so friction doesn’t affect their performance. Nature has actually already shown us that molecular motors are possible. Certain proteins can travel along a surface using a rotating mechanism that create movement from chemical energy. These motor proteins are what cause cells to contract and so are responsible for our muscle movements. Researchers from Germany recently reported creating a molecular rotor by placing moving molecules inside a tiny hexagonal hole known as a nanopore in a thin piece of silver. The position and movement of the molecules meant they began to rotate around the hole like a rotor. Again, this form of nano-engine could be used to power a tiny robot around the body. A rocket is the fastest man-made vehicle that can freely travel across the universe. Several groups of researchers have recently constructed a high-speed, remote-controlled nanoscale version of a rocket by combining nanoparticles with biological molecules. In one case, the body of the rocket was made from a polystyrene bead covered in gold and chromium. This was attached to multiple “catalytic engine” molecules using strands of DNA. When placed in a solution of hydrogen peroxide, the engine molecules caused a chemical reaction that produced oxygen bubbles, forcing the rocket to move in the opposite direction. Shining a beam of ultra-violet light on one side of the rocket causes the DNA to break apart, detaching the engines and changing the rocket’s direction of travel. The researchers hope to develop the rocket so it can be used in any environment, for example to deliver drugs to a target area of the body. My own research group is among those working on a simpler way to carry drugs through the body that is already being explored with magnetic nanoparticles. 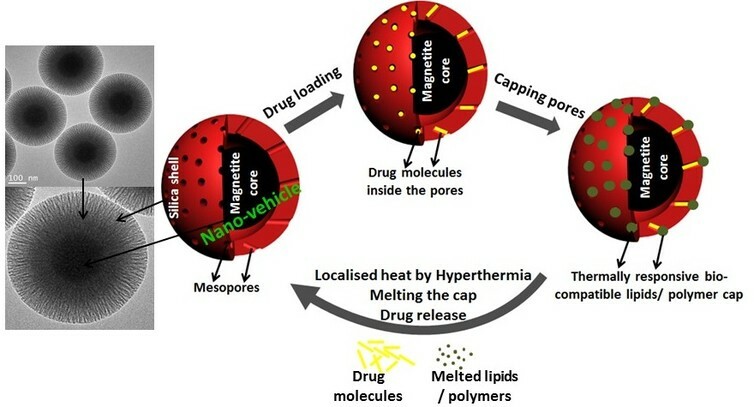 Drugs are injected into a magnetic shell structure that can expand in the presence of heat or light. This means that, once inserted into the body, they can be guided to the target area using magnets and then activated to expand and release their drug. The technology is also being studied for medical imaging. Creating the nanoparticles to gather in certain tissues and then scanning the body with a magnetic resonance imaging (MRI) could help highlight problems such as diabetes.